Every manufacturer of medicinal products needs to verify the GMP compliance status of all the APIs used in manufacturing. In Europe, this is the role of the Qualified Person (QP) to verify the GMP compliance of the APIs used before releasing a batch. In order to support the pharmaceutical industry, the Active Pharmaceutical Ingredients Committee (APIC) - a sector group of the European Chemical Council (CEFIC) – has developed an audit scheme which aims to meet all the regulatory requirements. If a pharmaceutical company is not able to perform all the GMP audits alone, so-called “Third Parties” can be called on. Yet, the European Medicine Agency (EMA) has defined strong rules for Third Parties in order to avoid a so-called “conflict of interest”. This might be the case when the manufacturer of an API initiates an audit on his/her own. The APIC/CEFIC has defined an audit standard which considers the strong regulatory requirements. Independent auditors perform audits according to a standardized approach. Only pharmaceutical manufacturers are able to initiate an audit. 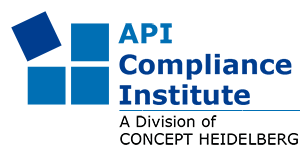 So-called “Shared Audits” are an alternative to the regular Third Party Audits organised by the API Compliance Institute (ACI). Here, two or more pharmaceutical companies initiate an audit. A Shared Audit will allow sharing the costs of the audit between the parties involved.